Castor Sealer is ideal for all slip rubber and latex materials. Eliminates the need for rubber mask grease and prevents discoloration when creme makeups are applied. 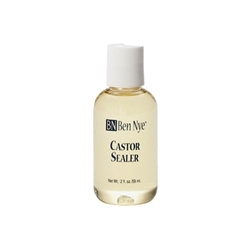 Castor Sealer is good for approximately 15-40 applications per ounce. Available in .5 oz., 1 oz., 2 oz. & 8 oz. size.